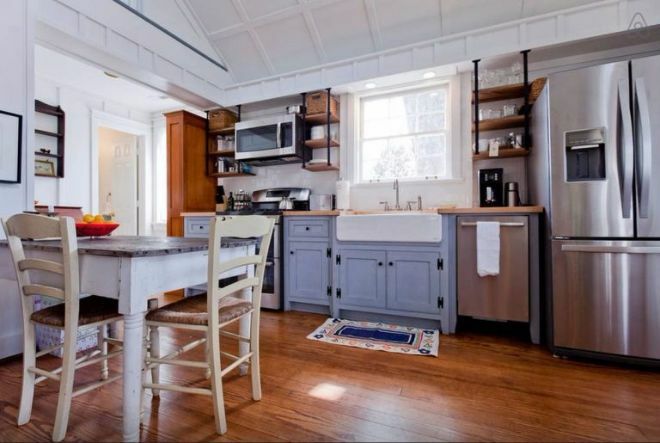 Tour this fully renovated cottage on a farm: the tiny kitchen is gorgeous! 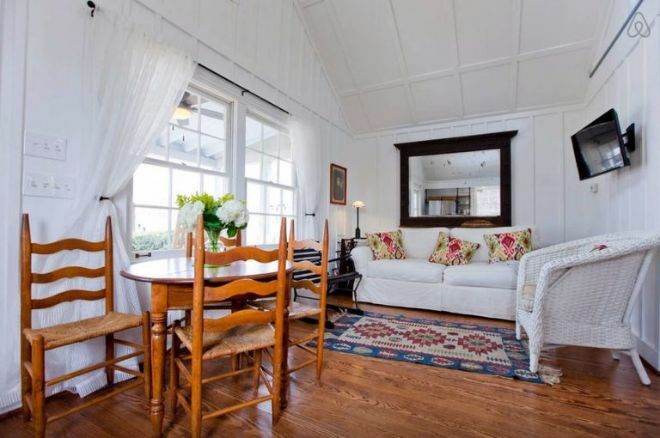 This quaint cottage is located on a peaceful Nashville farm surrounded by horse pasture. The interior is fully renovated, and every design detail is beautiful. It's country cute, but feels current and contemporary thanks to the use of on-trend finishes. The cottage is available for vacation rental through Airbnb, what a wonderful place to spend a relaxing weekend! The home is full of warm woods, crisp white walls, and the perfect mix of antique furniture. The layout is a great example of efficient small living. 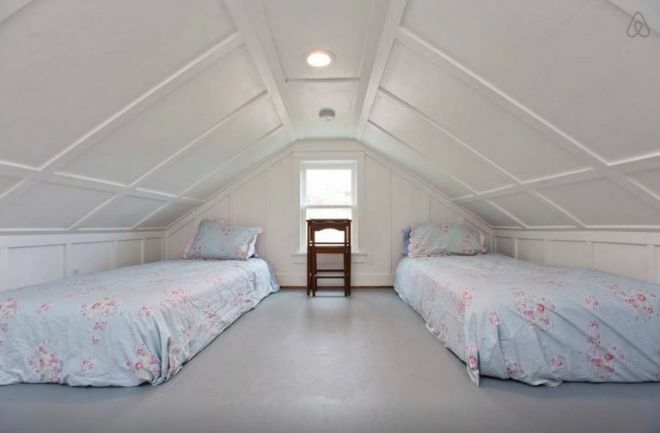 There is one bedroom and one bath, with extra sleeping quarters available in the dreamy upstairs loft. The rest of the house is an open layout that includes the living room, dining room, and kitchen. Take the full tour below! The main living area is a true cottage-living fantasy. Although the space is small it's fully functional and ready to accommodate visitors. There's plenty of places to take a load off - with two dining tables and living room seating. The living room is simple and lovely with white walls, white flowing curtains, and mostly white furniture. A large mirror above the sofa is a great trick to make a room feel more spacious. The kitchen only takes up one wall, but packs a big punch. Open industrial shelving add function and style. The choice of blue cabinets is an unexpected and chic surprise. 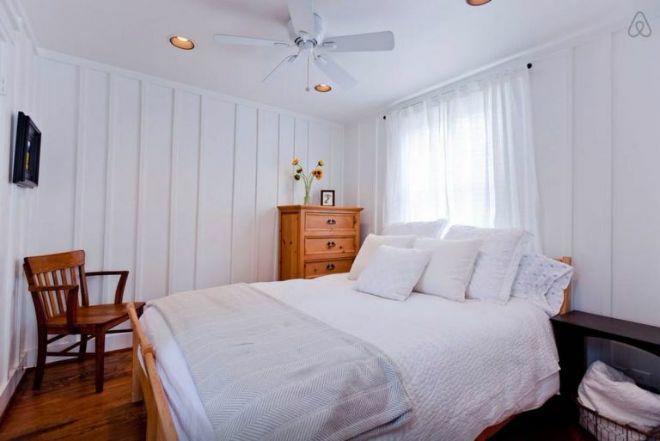 The mostly white theme is carried into the cozy bedroom. The wood furnishings make for a rustic space, and the all white bedding creates a luxurious feel. 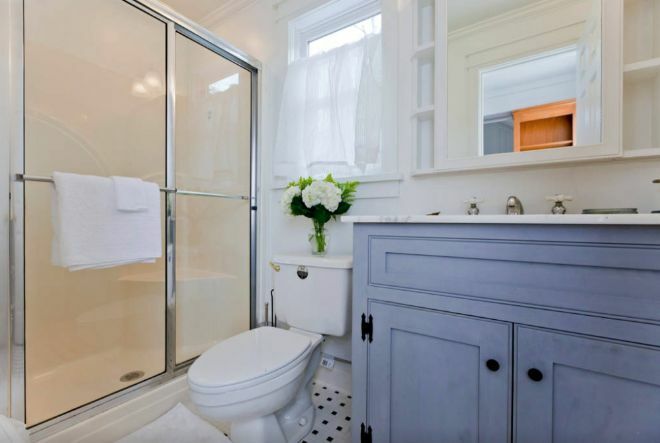 The blue vanity in the bathroom matches the kitchen cabinetry. This type of cohesiveness is important when decorating a small house. 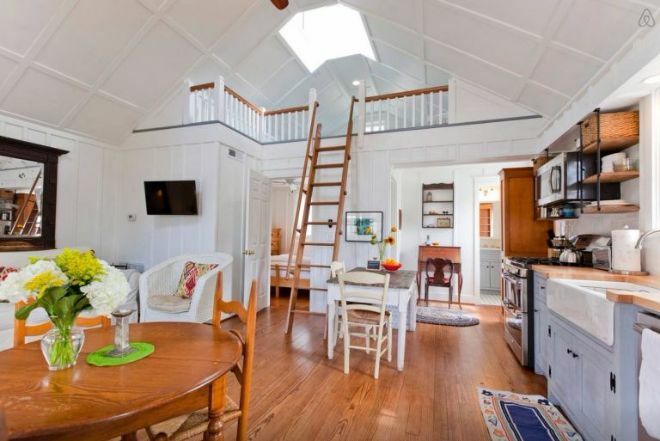 The ladder on the first floor leads up to a bright and happy bedroom loft. 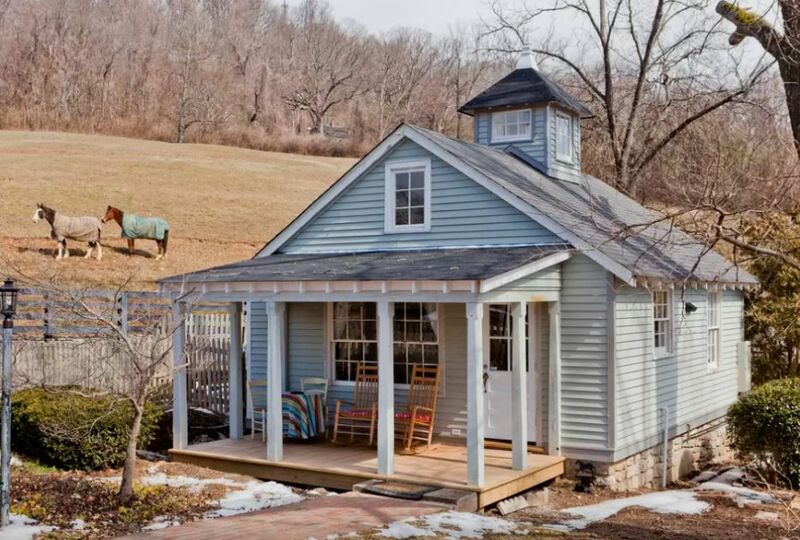 The perfect space to dream about your own cute blue cottage on a farm! You'll love this Bohemian style home full of bright light and natural wood accents. This small home in British Columbia, Canada is a DIY dreamland.